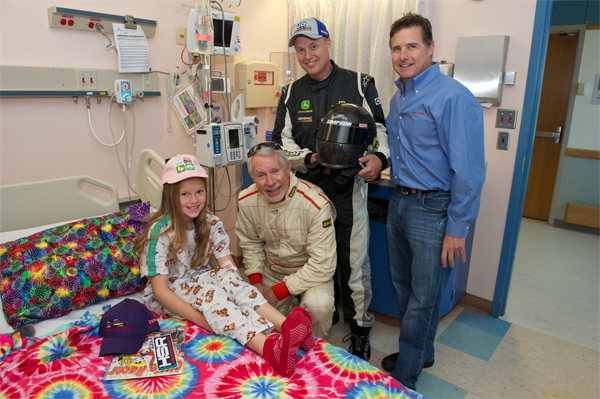 Brianna Lucas received a visit from drivers Jeff Mitchell (top), Peter Grant (bottom) and Racing for Kids co-founder Robbie Buhl (right). 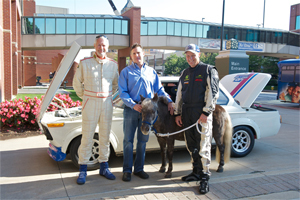 After a successful visit in August with veteran IndyCar Series driver Ed Carpenter, Racing for Kids stopped the races and popped in for another visit at Akron Children’s Hospital. But this time around, Racing for Kids shook things up and joined forces with Historic Sportscar Racing. Visiting patients this time around were drivers Jeff Mitchell and Peter Grant. Mitchell brought along his 1974 BMW 2002 and Grant brought his 1985 BMW E30 318i for kids to enjoy and sit in the drivers seats. 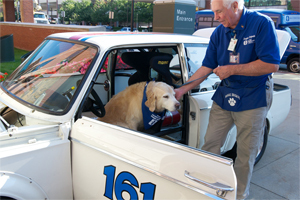 But the kids weren’t the only ones enjoying the cars – Petie the Pony and Doggie Brigade member Spats also joined in on the excitement. Mitchell and Grant spent hours going room to room, signing autographs and posing for pictures with patients in their racing suits. Racing for Kids, a non-profit that brings professional drivers to local children’s hospitals, while raising awareness and funds for the healthcare needs of children and those hospitals, is celebrating its 25th anniversary and has been working with Akron Children’s for 24 years.